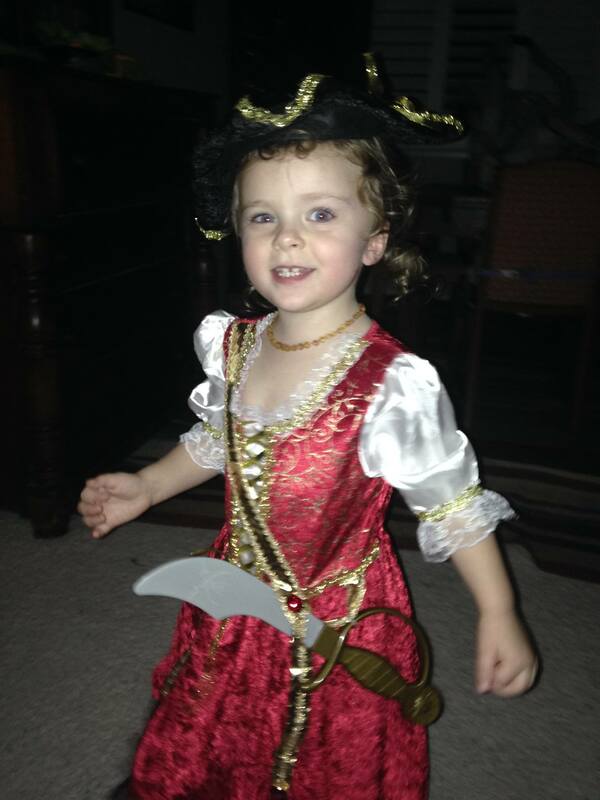 As you can see in the photo, my daughter Brontë loves everything about being a Halloween pirate queen. Being a massive fan of dressing up, she jumped right on board the Halloween train as soon as she figured out costumes would be involved. She’s a fearless and enthusiastic kid. Whenever we’re in public, she screams “HI! WHO ARE YOU?” to every passing stranger (sometimes embarrassing her shy parents) and is disturbingly unafraid of most things. She will grab strange dogs, hurl herself face-first down the tallest slide on the playground, and resents still being too short to ride upside-down roller coasters. Physical challenges do not intimidate Brontë one bit. Psychological dangers, on the other hand, push her toddler imagination to the brink. She insists on keeping the lights on and the closet doors shut at bedtime. We have tried easing her into a dark bedroom with night lights and glow-in-the-dark ceiling stars, but she shrieks in bloodcurdling terror whenever the door closes. Anything less than stadium lights and welded closets make you monster bait. Still, her sister and parents were going to be with her as she strolled the neighborhood streets at dusk, collecting candy. Candy is one of her favorite things, and apparently, random strangers were about to fill her Frozen bucket with chocolate whenever they answered the door. It sounded like an excellent idea. We were stepping into the quiet streets, hand-in-hand, when Brontë looked around her and realized the world was scary. Demons had invaded the calm, familiar row of houses surrounding our nest. Graves with emerging skeletons had mushroomed up around our neighbor’s rose bushes and witches were menacing the hedges. Ghosts with glowing eyes hung from doorways. Brontë swiveled in circles, surveying the haunted dangers surrounding her, and dropping to the ground, she threw her head back and screamed. I grabbed her tight and reminded her it was all pretend. People put up scary decorations on Halloween, but everything is make-believe. Mommy and daddy were with her, nothing could hurt her, and we were going to knock on the door and people would give her loads of candy. It’s fun! Brontë sobbed for a minute as she considered my offer. I wiped her tears and kept reassuring her as she squeezed my hand and tried to rally for this demonic treasure hunt. A look of determination shot from her toddler eyes and she realized that to obtain said candy, she would have to pass through the witch-laden obstacle course guarding each door. We began walking up a driveway and Brontë squeezed my hand harder with every step. She pulled back as we passed a dancing skeleton and stepped nervously under a hovering bat. We finally reached the door, knocked, and waited. The door swung open and Brontë froze. “Trick or treat?” I offered, smiling weakly at our neighbor as I tried to demonstrate how these Halloween negotiations go down. Brontë started visibly shaking before she slowly, tentatively stretched her tiny hand toward the candy bowl. A flash of light sparkled across her arm and when she turned to investigate its source, she found herself face-to-face with a jack-o-lantern. His menacing triangle eyes glowed with flickering candlelight as his lips curled into fanged pumpkin laughter. Brontë dropped to the ground, hugging her feet, and let out a bloodcurdling scream. Our neighbor’s face fell. She bit her lip as she rushed over to help me reassure Brontë. We told her everything was okay, her shoulders heaving and dropping in full-blown panic. John dropped some candy in the Frozen bucket and we thanked our neighbor while leading Brontë away from the sarcastic pumpkin king. I tried to give my daughter a pep talk, telling her everything was alright and that the next house would be easier. Brontë squeezed my fingers white then nodded when she was ready to proceed. We walked past bat lanterns and flat frightened cats to the next doorway light signaling “candy oasis” to wandering children. Brontë steadied herself as we approached the door. She went rigid, so I squeezed her shoulder reassuringly as I pressed the doorbell. The door swung open and another neighbor emerged with with a giant bowl of goodies. He looked down at Brontë with a welcoming smile. She looked back at him, threw both her arms straight in the air, and ran away screaming. Dropping her Frozen bucket on the porch, she fled across the lawn and started running back home. “She’s, umm, a little scared,” I told our neighbor. “Maybe next year?’ He nodded sympathetically. We found her banging on the front door of our house, shaking with sobs. I picked her up and carried her inside, where we waited until she had calmed down before leaving to visit grandma and the rest of the family at a halloween get-together. Brontë’s cousins took one look at Brontë’s empty Frozen bucket then shook their heads in quiet sympathy. They huddled in a toddler negotiation circle for a few moments before each contributing a little candy to Brontë’s tragic bucket. It was sweet. Maybe next year will go better. At least Brontë knows that the village is on her side. 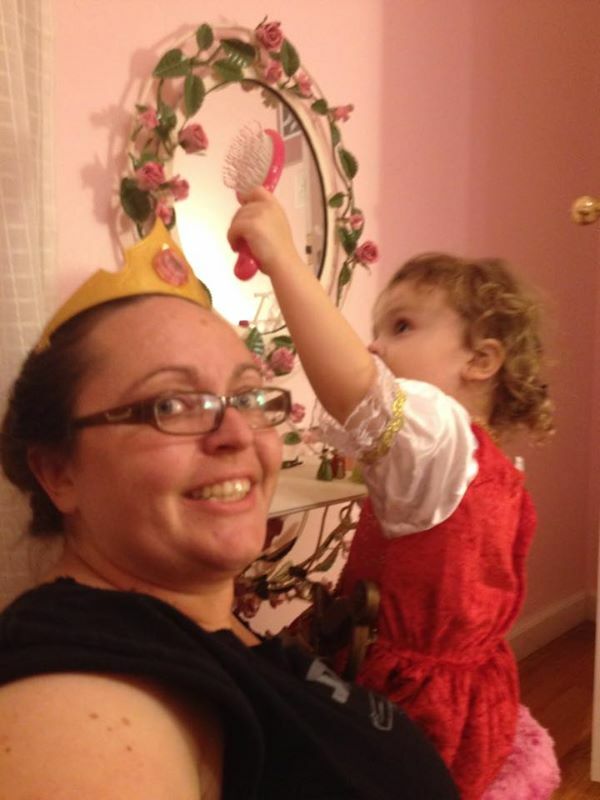 Bronte retreats to familiar ground, giving her aunt a princess makeover. It will get better, as long as you don’t reinforce the avoidance behaviors. Keep judiciously nudging her to get comfortable in unfamiliar situations. (I used to be a child and family therapist) Remind her that she did go out and knock on a couple doors and nothing bad happened. Sorry if I sound like an opinionated internet troll. Parenting is hard and doesn’t come with an owners manual. I’ve raised a couple of anxious kids of my own. Doesn’t sound trollish at all, thank you for the advice. It can be so tough to determine when you’re being reassuring and when you’re unwittingly rewarding or reinforcing negative behaviors. I assumed the candy reward would be enough of a positive reinforcement! Physical challenges are easier… I’m more confident calculating whether an activity could really hurt her or only threatens a skinned knee. Imagination is boundless. Poor little thing! I remember my oldest running screaming out of Santa’s grotto a few years ago. My experience now that they’re 5 and 11, is that fears can just melt away when they’re ready to grow out of them.